Once I found a way to stop trains wobbling about, I was much more motivated to build things. I could claim this was part of a grand plan to build a realistic operating system but if I’m honest it’s because I like watching the trains rattle round and round, and I wanted a few more wagons on mine. 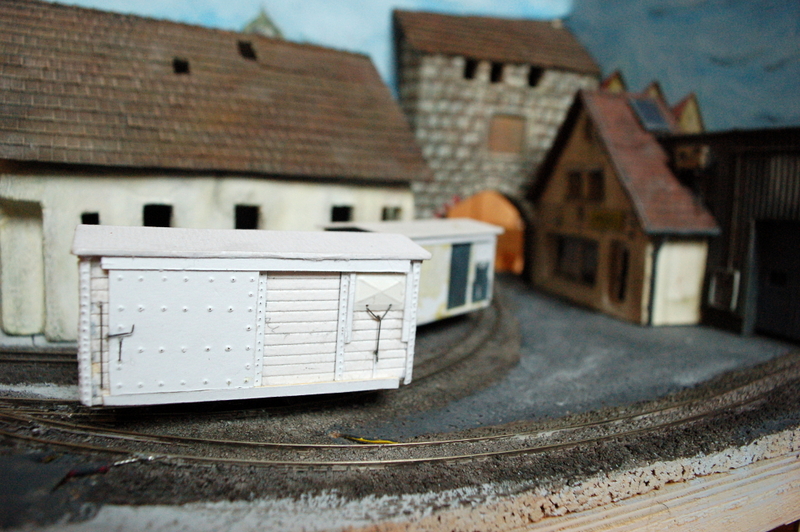 I started looking through pictures of real narrow gauge vans. Of course one thing led to another and I ended up adding bits of wire all over the model in the hope it would then look all fine scale* and detailed. The standard way to ventilate vans here seems to be a sliding panel which I assume is operated by staff unclipping and sliding the metal rods underneath. On the original van I made the panel from card, but on the new version this didn’t seem to work so I gave up and used the evil plastic. The picture shows some of the problems that I’m causing myself with this model. The van in the background is a long way onto the other track, but still overhangs the main line** by some way. In fact the van in the foreground is probably on the one place on the loop that I can get another train past it. This is one of several reasons why the Höfelbachbahn will now disappear at least until after exams, until I can make it a more sensible shape.